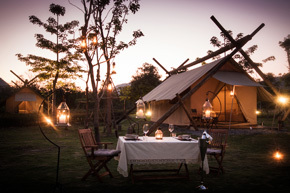 An exquisite chic tented camp resort built in contemporary architecture blended with African elements set within a lush tropical landscape on the outskirt of Khao Yai National Park. The tented resort is surrounded by the natural beauty of the sub-tropical forests and grasslands, overlooking the distanced lime-stone mountains. Our eco-friendly resort features 31 elegantly appointed tents and tree houses complimented with supporting facilities and activities for a back-to-nature experience and childhood camping memories.